Project ID : MAXforums.org "Let's Ride" workshop - low poly vehicles. 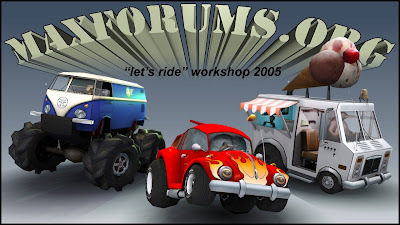 During autumn 2005, a workshop at MAXforums.org was launched. Under the name "Let's Ride" the participants were to make one (or as I did more than one) vehicle for a little minigame of the racing kind. The workshop was launched by Ronan Hayes (Edge) and Timothy Hanslow (Timpa) - primarily to test some dynamics features for Edge's upcoming game "1944 D-day". The rules were simple : Max. 4000 polygons (triangles) pr. car - make stuff breakable or detachable at will. Use whatever textures you need - up till a size of 2048x2048. Take advantage of the advanced shaders supported by the engine - as well as normal mapping - if you feel like it. - I didn't. I decided to keep it simple.... and humourus. I've always been a fan of games like Mariocart, Crash Team Racing, Twisted Metal and the likes, so i decided to make my cars a bit toony. 2. Ollie (from Vomic.com) driving a souped up VW Beetle. They were all made during a month or so, whenever I had a few hours to spare. These are also my first real attempts at texturing anything, based on a UVW unwrap. All in all it was a great learning experience - a great way to test some of my newfound skills, developing content for games, on a personal project. *TurnTool interactive scenes unfortunately only works with 32 bit version of Internet Explorer, and to my knowledge, none of the newer versions of Firefox or Chrome. - or you can just have a look at the "turntables" below.